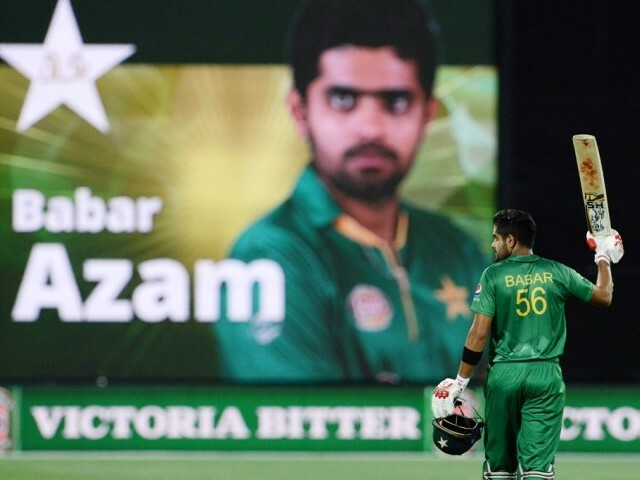 Pakistan middle-order batsman Babar Azam entered the top 10 of the International Cricket Council’s (ICC) ODI rankings for batsmen on Friday. The 22-year-old, who scored 100 off 109 balls in the last of the five ODIs against Australia, jumped five places to reach the 10th rank for the very first time. His century was the first by a Pakistani batsman against Australia Down Under since Zaheer Abbas scored one in 1981. He managed to score 282 runs in the series. Earlier, Babar became the joint fastest to reach 1,000 runs in ODIs to be named with the likes of Viv Richards, Kevin Pietersen, Jonathan Trott and Quinton De Kock. Also, he is the fastest Pakistani to score 1,000 runs beating Azhar Ali who achieved the feat in 23 outings. Meanwhile, Pakistan opener Sharjeel Khan managed 250 runs against Australia in the ODI series courtesy three half-centuries. He also moved up in the rankings to a career best 53rd position. Australian swashbuckling left-hand opener David Warner moved to the top of the ODI rankings for the first time in his career courtesy two centuries against Pakistan in the recently concluded series. The 30-year-old leapfrogged South African captain AB de Villiers and Indian skipper Virat Kohli to move 19 points clear of the former after scoring 367 runs in five matches. With the ICC Champions Trophy scheduled to be played from June 1 till 18, Warner hopes his form will help him guide Australia to their third trophy. “It is a huge year for one-day cricket with the ICC Champions Trophy later this year and I am hoping I can take my good form into that tournament and help Australia lift the trophy for the third time,” Warner told ICC. He added that his main focus is to win matches for the team. “It is always a great honour to receive these accolades, but from my perspective, my job is to put our team into winning positions and I have been fortunate that I have been able to do that,” he said.